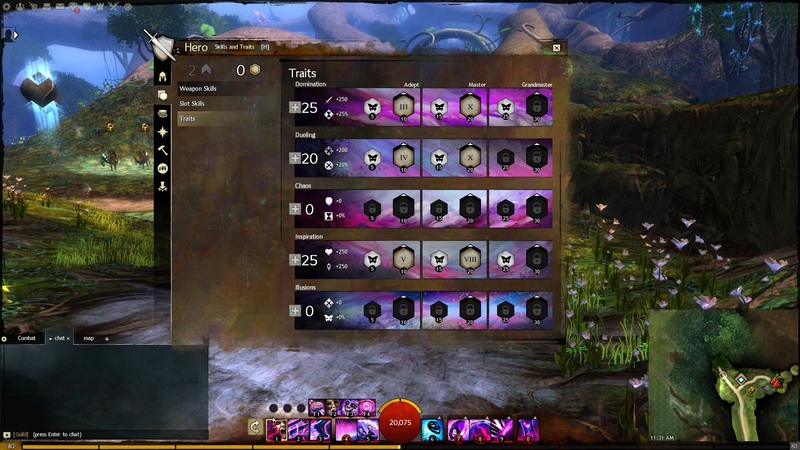 As I wrote about yesterday, I am pretty unhappy with how the new trait unlock system works. One thing I noticed from comments I’ve received on twitter and the like, is that a lot of people, having had characters already made and leveled before this change was made, were unaware of how bad some of the required unlocks are. This post will serve two purposes: to list out all of the current trait unlocks, and then to list some of the ideas we’ve come up with that would make good replacements. This will be a long, text-heavy post. But I hope it’ll help in getting more attention brought to this issue and for it to be rebalanced in the future. 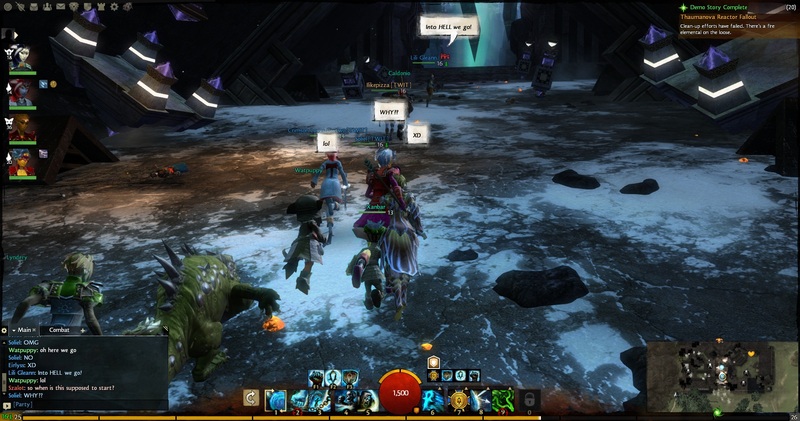 So the feature patch for Guild Wars 2 has been out for a few days now. It’s not 100% perfect – there are some bugs, such as dailies not resetting properly for some (a problem I had happen), chat breaking on Tuesday, and some things not unlocking properly, but largely it’s been a smooth roll-out. The wardrobe is great; it took me a few tries to get all of my PvP skins to unlock, but once I did that I wound up with over 600 skins unlocked on my account. Account-wide dyes are also amazing, and I was surprised by how many unidentified dyes I wound up with once I finished going through all of my characters. I’ve actually been playing some sPvP and enjoying it. Megaservers I’m not really a fan of, but thus far I’ve seen no real glitches with them. There is one thing that really has me bothered though, and it annoys me even more because it was something I thought had potential to be really cool, and that is the trait unlocking. So to start out, when I initially logged into all of my characters, it became clear that unlocks are the same across every profession. The new trait for each profession in trait line A are unlocked by fighting the Risen High Wizard in Cursed Shore, B are unlocked by defeating the Priest of Grenth, and so on. That was the initial disappointment – that there’s no variety across professions. There are so, so, so many options available out there…so why lock every profession to the same few events? There’s also the fact that unlocks are character-specific instead of account-based, so if you have a lot of characters…have fun doing those same things repeatedly to get all of your new traits. The other thing is that the unlocks are not even remotely even. Of the new grandmasters, they consist of the Risen High Wizard and Priest of Grenth, as I mentioned, as well as the Karka Queen, Risen Priestess of Lyssa…and going to a ship in Straits of Devastation. Um, what? I don’t really get this. The ship is minorly annoying because it’s underwater and there’s a couple vets there, but that’s all. Grenth is an event that is very easy to mess up and fail, Lyssa is just long and tedious, Karka Queen is a pain to spawn…High Wizard is generally pretty easy, to the point where it dies too quickly. The disparity in how to unlock the traits becomes even more apparent when you look at the adept and master traits, though. One of the things I did on Tuesday was make a new characters, specifically for playing through with the new changes. The character I made was a thief, as she is based on a roleplay character of mine. To start out, thief is a hard profession to play without traits, so not having any until level 30 was painful. When I did hit 30 last night and was able to unlock a trait, I decided to look through the unlocks for major traits and…ARE YOU KIDDING ME. An adept trait, that you’ll have trait points for at level 36…what. There are so many problems with the requirements to unlock traits. 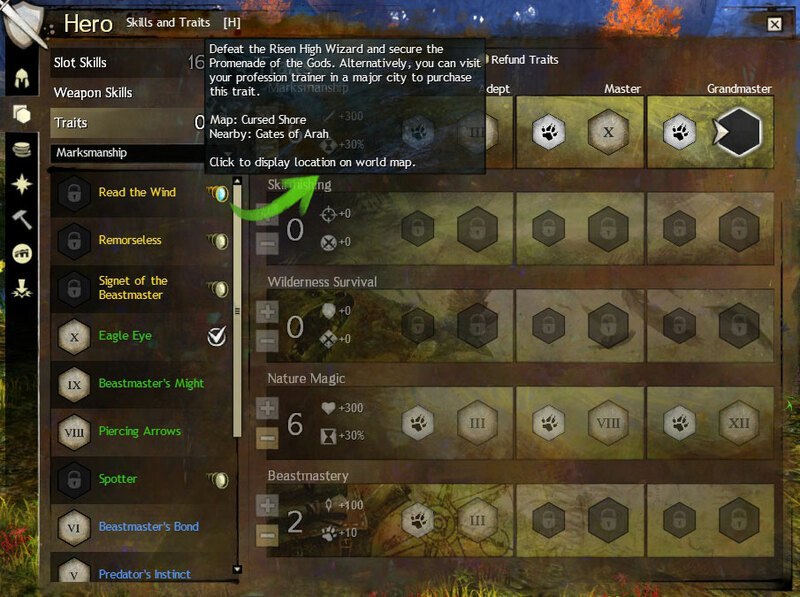 For starters, the vast majority of the adept traits, which you’ll have points to unlock starting at level 36, require completing content far above that level – one requires map completion of Gendarran Fields, which is somewhat reasonable, but very few of the others were anything below level 50. Many require keeping up on personal story. 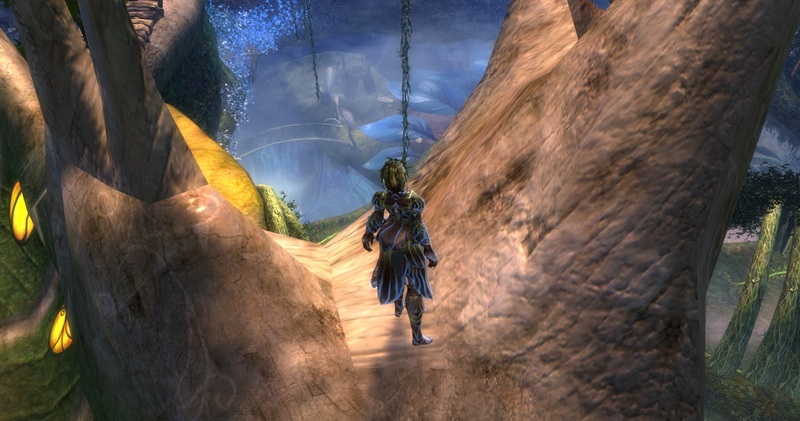 There are ones that require map completion of zones such as Fireheart Rise, Mount Maelstrom, and as pictured above, Frostgorge Sound. To which I have to say – seriously? These are low-level traits that people should be able to unlock easily. They are ones that you should be able to use at low levels. They should not require mapping level 70-80 zones to get. 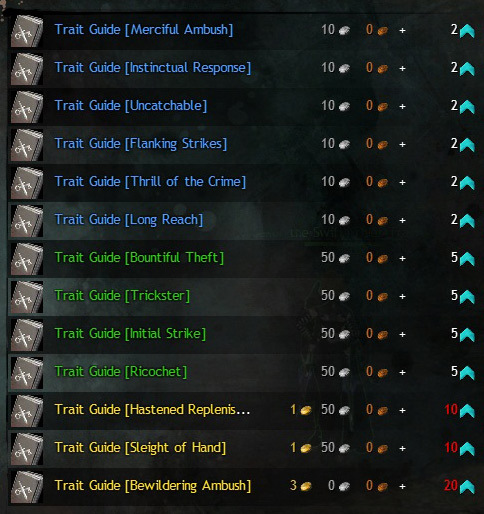 Most of the master traits require lower level content than many of the adept traits, and that, honestly, is just wrong. The other major issue I have with it is so many traits are tied to personal story or map completion. Why do this? 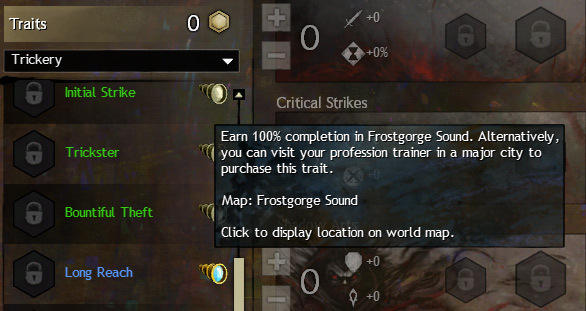 That, along with there being no variety between professions for unlocks, just makes zero sense to me. There are so many events in this game – thousands of them. So many jumping puzzles and mini-dungeons. More than enough that they could have easily tied each trait on each profession to a different, level-appropriate event, and not had any problems, or doubles. This also would do a much better job at encouraging people to explore zones than just…having them map a handful of mid to high level zones. This must be the new goldsink now that armor repairs are free. …they aren’t horribly expensive individually, other than the new grandmasters. But at the same time, it’ll be far, far more expensive to unlock traits this way than simply buying a trait book last week was. It’s 10 silver per adept trait, as well as the skill point cost. Six adept traits, across five trait lines…that’s 3 gold right there. 10g for the master traits. A whopping thirty gold for grandmaster traits. On top of having to spend 360 skill points. That is, of course, if you want to unlock everything. But with free trait resets being available whenever you want, why wouldn’t you want all of your traits available to you? How are you supposed to experiment and find a build that you like without having all of the options available to play with? The changes to traits really, really bother me. It had so much potential to be something really neat, but it just feels like the ball was dropped so badly on this one. I’m not one of those people who thinks this whenever there’s something I don’t like, but this made me really wonder if whoever selected the unlocks for each trait actually plays the game. Between the level increase to unlock traits (seriously, waiting until level 30 is terrible. If it had to have been changed, it should have been to level 20, at the highest), and the requirements to then unlock traits, I see this as being something that is more likely to hinder and put off new players, rather than make it easier, as was the intention. I really hope that these things get looked at and adjusted to being something more reasonable. I know this will likely put a dent in my desire to make and level tons of alts, and I know the game very well. This isn’t a quality of life change; this is one that has potential to cause real harm to the game. Someone please rebalance these! Edit: I’ve written a follow-up post where I go over the details of every single trait unlock, as well as make some suggestions as to how to fix this. Please take a look! 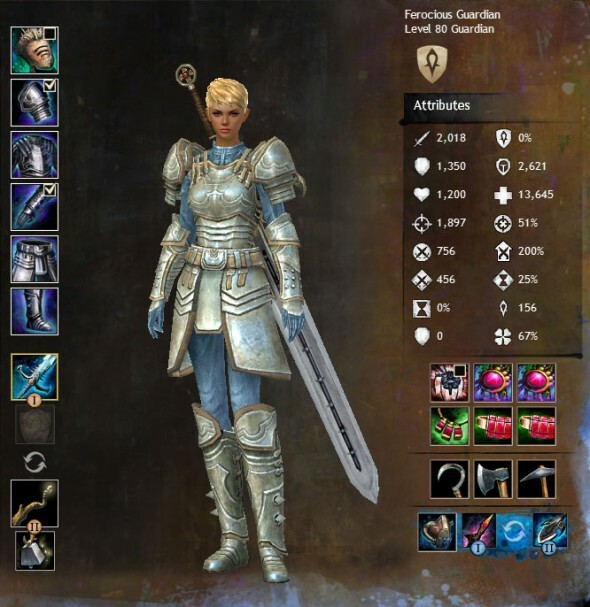 When it comes to Guild Wars 2, there are certain skills that are just better than others – whether or not it actually is more effective, it’s more fun, or you just simply like it more. I certainly have my favorites, skills that I make use of more than anything else! So, in no particular order (other than how much I play that profession), here are my favorites of each professions’ skills. On we go! Create a dome around your foes that reflects projectiles. 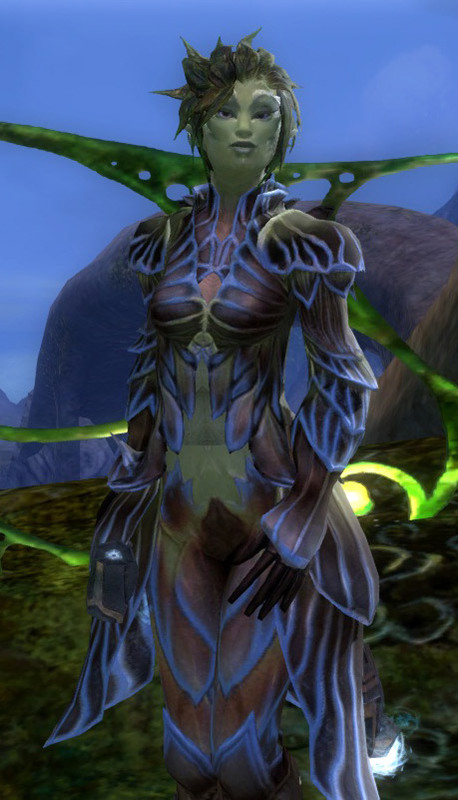 My mesmer is my main, and it’s no hiding the fact that I love playing her. Feedback is one of those skills that basically never leaves my bar. It’s useful basically everywhere – so many enemies use projectiles, and even without that, it’s an Ethereal field, meaning that it can be used to apply Confusion to enemies, or Chaos Armor to yourself and other allies. There’s also the fact that a well-timed Feedback can do massive amounts of damage to enemies as well as saving your team from nasty conditions (fun fact! You can Feedback Agony onto bosses in Fractals!). Love it. Illusionary Warden, Illusionary Berserker, and Blink also rank very high. Chaos Storm would make the list but staff on mesmer needs some love first. Longbow rangers tend to be a love them or hate them thing. 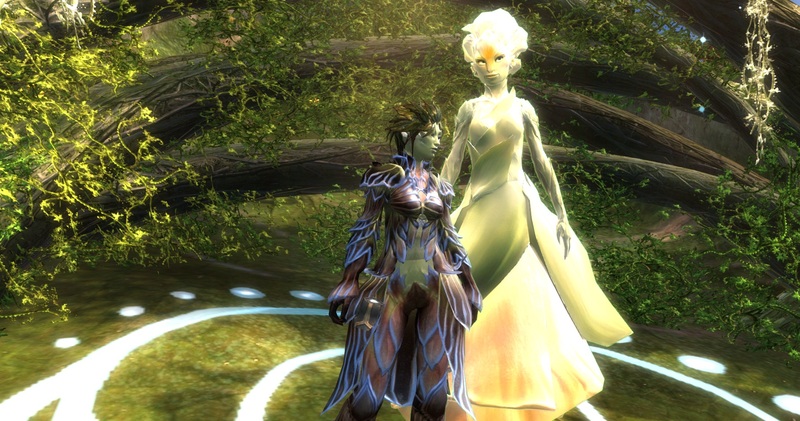 I fall firmly on the side of “love them”; my ranger is the owner of Kudzu, the first legendary I made. Barrage is by far my favorite ranger skill, possibly my favorite skill in the game (I’m just saying, Feedback has some stiff competition there). It’s a large AoE, it deals heavy damage, and it cripples things forever. Whatever you hit isn’t going anywhere. It’s great in situations where there are lots of enemies, and I love nothing more than using Barrage into an enemy zerg while in World vs. World. Oh it’s so much fun. But yeah, what I’m saying here, is Barrage is awesome, and my guildies can attest to how frequently I say “I love using Barrage…”. I play my guardian as a support guardian – healing, boonspam, and shouts everywhere! Staff is my weapon of choice there, and my guardian is the owner of my second legendary, Bifrost. Empower takes it as my favorite guardian skill, because it’s just so darn good. It heals – a significant amount. It channels might – up to 12 stacks of it. It has a decent recharge. It being a channel can be a bit tricky at times – I hate when I get interrupted in the middle of throwing around heals and might – but a quick “Stand Your Ground!” just before takes care of that. Renewed Focus is a close second, simply because of the number of crazy things I’ve managed to survive due to those three seconds of invulnerability, but ultimately I like Empower more. Target area pulses, damaging foes and inflicting vulnerability. I actually had a hard time deciding which necro skill I liked best – Life Transfer, Consume Conditions, and Lich Form all were contenders. But when it came down to it, I knew it had to be a well. I love wells. When I was running a condition build, my utility bar was all wells, with the trait to make them placeable at range. Now that I run a more DPS-focued melee build…I still use wells, but instead I now bomb enemies with them as soon as I’m in melee range. Between the size of the AoE and the damage ticks, a well-placed well just melts everything. So much fun. Your next few attacks heal you. I had a hard time picking one for thief; despite the fact that my thief was my third level 80, I’ve had a hard time really clicking with the profession. I’ve recently decided to try out a venom share build, though, and I think I finally have it – something I can enjoy playing. With that said, I have to go with Skelk Venom. For this one, it’s really less about the skill itself – it’s a good skill, don’t get me wrong – but rather what it allows thieves to do. This one skill being added to the game single-handedly made thieves capable of lending support to other players. So yeah. Venoms. They’re fun. Block attacks with an energy shield. If it blocks three attacks, it explodes. Yeah, I’m not going with the hilariously overpowered Conjure Frost Bow here. I’m going with my good old friend, Arcane Shield. 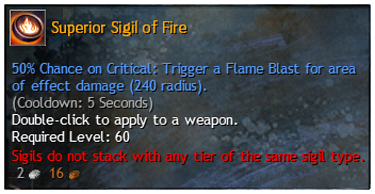 This skill is responsible for my elementalists (both of them!) dying half as frequently as, realistically, they should have. “AHHH THINGS ARE EATING ME!” quickly turns into “pop Arcane Shield and RUN AWAY”…and I’m still alive at the end of it. Really can’t go wrong with that! It’s also great for anything where getting hit when channeling (hi, skill points!) interrupts you and you just don’t feel like dealing with it. Or running in to grab points of interest and trying to avoid that champion patrolling around. Basically what I’m saying, is Arcane Shield is one of the best survival skills in this game. Drink Elixir B to gain fury, might, retaliation, and swiftness. Another where I’m not picking the more universally popular skill (sorry guys, I hate Grenade Kit. I’m not fond of ruining my wrists going click-click-click-click-click repeatedly). I run a conditions/support build on my engineer, revolving around the Elixir Gun and other elixirs. Of the utility elixirs, Elixir B is my favorite. I mean, come on now. When are those boons ever not useful? Never, I say. The toolbelt skill for it is a source of stability, something that is always helpful. And with the right trait setup, those boons last forever. It’s excellent. Place a battle standard that revives fallen allies and grants fury, might, and swiftness to allies. I have a confession to make. I don’t actually use Battle Standard all that often. I tend to run around with Signet of Rage on my bar. However, that’s because most of the time when I’m just running around on either of my warriors, I’m alone exploring zones. When it comes to group events, dungeons, battling in Lion’s Arch, or anything where there are large amounts of people, though? Battle Standard all the way. The boons are nice, but it’s the revive that makes it so handy. The best use I’ve ever seen of it was someone using Vengeance and then Battle Standard to save our group from a wipe while fighting Giganticus Lupicus in Arah. It’s a situational skill, to be sure, but it’s also a great one. So there we go! Those are the skills that I like the most and think are overall the best and most useful for each profession. This is, of course, all just my opinion – I don’t expect everyone to agree! But hey, give them a try. Maybe you’ll find a new favorite you’d never thought about before!